So, what’s the problem? This verse is constantly torn out of context. Do you know the immediate context? Most people don’t. This past weekend I spoke at a youth conference. Sixty or more people attended. 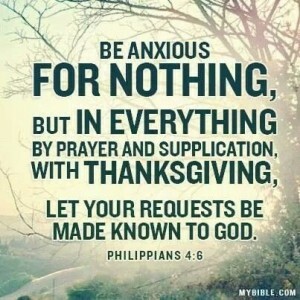 I asked, “How many of you know the verse Philippians 4:6, “Do not be anxious for anything, but in prayer and supplication with thanksgiving, let your requests be made known to God.”? Lots of hands went up. I then inquired, “Who can tell me what comes before it?” The response…silence and blank stares. Now, I’ll grant you that the vast majority were senior high youth, but multiple pastors and youth leaders lined the room. All were equally clueless. The phrase just before verse 6 is, “The Lord is at hand” or “The Lord is near” depending upon your translation. Those five words make all of the difference in the world. While yes, we are suppose to not worry and pray while going through tough times. Being free of fear becomes immensely easier, when we know in our hearts God is at hand. Let me give you a simple example of how that knowing someone is near can make all the difference.. Recently, I was in a yoga class when I heard a loud pop and the woman in front of me dropped to her knees. She was in obvious pain. Long story short, it was her first time back to class after having a hip replacement and her hip popped out of socket. She and the woman next to her are good friends of mine and both from my church. We immediately started assessing the situation and trying to reassure her. Excruciating pain held her to the mat. She obviously needed medical attention. We called 911. An almost audible sigh and visible wave of relief washed over everyone the minute we could tell her, “Don’t worry, the paramedics just pulled into the parking lot.” At that point she knew one way or another she was now going to get help and relief. People don’t just need instruction to not worry. They need to know they’re not alone. More importantly they must believe they are in the hands of someone who can transform the situation. That’s why it’s so very important that when you urge people to not be anxious and prayer, that you lovingly remind them God is at hand. They are not alone. The Lord of heaven and earth is near to them. Sharing stories of how God has helped you or someone else can be genuinely helpful as well. When hurt and fear consumes us, we forget how capable God is. Some people don’t know the power of God. They need to hear a witness to help them understand just why having God at hand can make all of the difference. Wondering What to Do for Daily Time with God? Drawing upon God’s presence in tough times is easier if we spend daily time with the Lord. 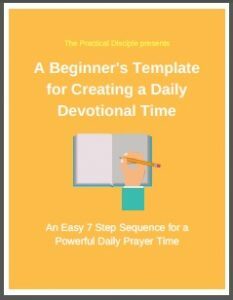 If you don’t have a daily discipline of prayer and maybe aren’t sure how to get started, I have a step-by-step guide, A Beginner’s Template for Creating a Daily Devotional Time. Download your free guide today by clicking the button below.